Having written the Deltora Quest series (among other things), Emily Rodda is a practiced hand at fantasy. 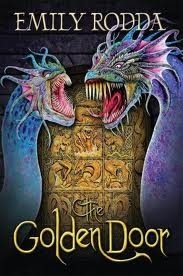 The golden door is exactly what you would expect from such a writer. It ticks all the fantasy boxes with magical things and strange beasts, a which-door-will-he-choose scene and a clearly plotted out progression of suspense and pay-off making it an enjoyable read which will likely be totally forgotten before years end but provided escapist entertainment on the train for me nonetheless. Rye is the third son of a poor family who work on the wall that protects his hometown of Weld from ravenous flying beasts known as skimmers. When I use the word ‘protects’ I mean ‘is utterly useless’ because, as I mentioned skimmers can fly. Anyway, all his brothers and finally himself go on a quest to sort out where these things come from. It is through this that Rodda introduces one of the great redeeming features of this book, a spunky heroine called Sonia. Rye and Sonia slip the bounds of Weld and head towards a realm where a tyrant is doing something nasty that they have to stop. A bonus in this is that stopping it doubles as a mechanism to try to save his brother Dirk (where does she get these names? ).